The moon, the largest and brightest object in the night sky, has long inspired curiosity and wonder. It appears at night, the time of sleep and dreaming that sometimes seems to approach the borders of death and the afterlife. Radiating an air of mystery and magic, the moon is also associated with love and often serves as a symbol of unattainable beauty. repeats each month. In ancient times, people used these phases of the moon to measure time. Themes and Beliefs. The moon's waxing and waning have made it a symbol of time, change, and repetitive cycles around the world. One such cycle is the constant alternation of birth and death, creation and destruction. People have linked the moon with both birth and death. The Polynesian islanders of the Pacific Ocean said that the moon was a creator goddess named Hina and that women called wahines were her representatives on earth. In ancient Persia*, the moon was Metra, the world mother. For some people the moon had a destructive aspect. The Aztecs of Mexico called it Mictecacuiatl and believed that it traveled through the night skies hunting out victims to consume. The Maori people of New Zealand referred to the moon as "man eater." Africans and Semitic* peoples of the ancient Near East also feared this terrifying aspect of the moon. In certain cultures, the moon had a gentler association with death. Some ancient Greek sects thought that the moon was the home of the dead, and early Hindus believed that the souls of the dead returned to the moon to await rebirth. The moon could even symbolize birth and death at the same time. The Tartars of Central Asia called it the Queen of Life and Death. In mythology the moon is often female, a goddess who may be paired with a sun god. The Incas of South America told of a brother and sister, the moon maiden and the sun man, who were the ancestors of the royal Incas. In the Mayan writing system, a symbol showing the moon goddess seated inside the moon was used before the names of noble women. The Greeks associated the moon with the goddess Artemis*, sister of Apollo. They also called it Hecate, Cynthia, and Selene. The Roman name for the moon was Luna. Native American names for the moon include the Old Woman Who Never Dies and the Eternal One. Sometimes, however, the moon is male. The Inuit of Greenland picture the moon as a hunter sitting in front of his igloo. Norse* mythology speaks of a moon son and a sun daughter, and Mrs. Sun and Mr. Moon are part of German folklore. People of many cultures have created myths and legends about the moon. 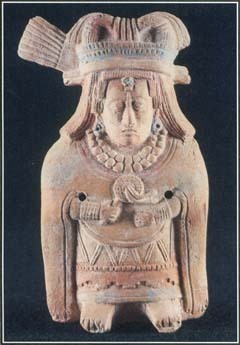 This pre-Columbian rattle depicts a moon goddess. in the moon occur in many mythologies. In China and Japan the lunar rabbit is said to mix a potion that gives immortality. The Moon in Myths. A Native American myth says that the sun and moon are a chieftain and his wife and that the stars are their children. The sun loves to catch and eat his children, so they flee from the sky whenever he appears. The moon plays happily with the stars while the sun is sleeping. But each month, she turns her face to one side and darkens it (as the moon wanes) to mourn the children that the sun succeeded in catching. The Efik Ibibio people of Nigeria in West Africa also say that the sun and the moon are husband and wife. Long ago they lived on the earth. One day their best friend, flood, came to visit them, bringing fish, reptiles, and other relatives. Flood rose so high in their house that they had to perch on the roof. Finally he covered the house entirely, so the sun and moon had to leap into the sky. According to the Greek myth of Endymion and Selene, the moon (Selene) fell in love with a handsome young king named Endymion and bore him 50 daughters. One version of the story says that Selene placed Endymion in eternal sleep to prevent him from dying and to keep him forever beautiful. People once believed that moonlight had a powerful effect on human behavior. Those who acted strangely were said to be "moonstruck," and lunacy, a term for madness, comes from Luna, the Latin name for the moon goddess. The Japanese believed that the moon was a god with powers to foretell the future. Priests would study the moon's reflection in a mirror, believing that if they gazed directly at the moon, it might drive them mad. Superstitions about the moon's evil influence made some people refuse to sleep in a place where moonbeams could touch them. In the 1200s, the English philosopher Roger Bacon wrote, "Many have died from not protecting themselves from the rays of the moon." A myth from the Indonesian island of Java tells how Nawang Wulan, the moon goddess, came to earth to bathe in a lake. A man stole her cloak of swan's feathers so she could no longer fly back up into the sky, and she stayed on earth and married him. Nawang Wulan used her magic powers to feed the household every day with just a single grain of rice. When her husband discovered her secret, she lost her magic power and had to gather and pound rice every day like all other wives. However, she did find her swan-feather cloak and used it to return to the sky. She stayed there at night but spent the daylight hours on earth with her husband and daughter. See also Hecate ; Sun . My Mum used to work in a mental hospital and every full moon the patients would become hyper or more unsettled than ususal. On one occasion, one of the patients felt she could fly and tried to climb out the window. My Mum had to assist the nurses in bringing the patient back to safety. After eleven years working in an mental hospital, my Mum truely believed that the full moon did affect the mentally ill.
Actually, it is not only the mentally ill that are affected- they are just more in tune with their bodies and are all around more sensitive, and therefore feel it more. The human body is something like %94 water. The moon and earth constantly change the gravitational pull on the oceans? tides. When the moon is full, it is almost like the tides are being pulled in tighter. Our bodies, henceforth our minds as well, can feel this and therefor react.